PHILADELPHIA (CNS) — An internationally renowned pioneer in climate science and climate change research, in an address at Villanova University, said that rather than “finger-pointing” about the causes of global warming, people need take collective action to slow the process. 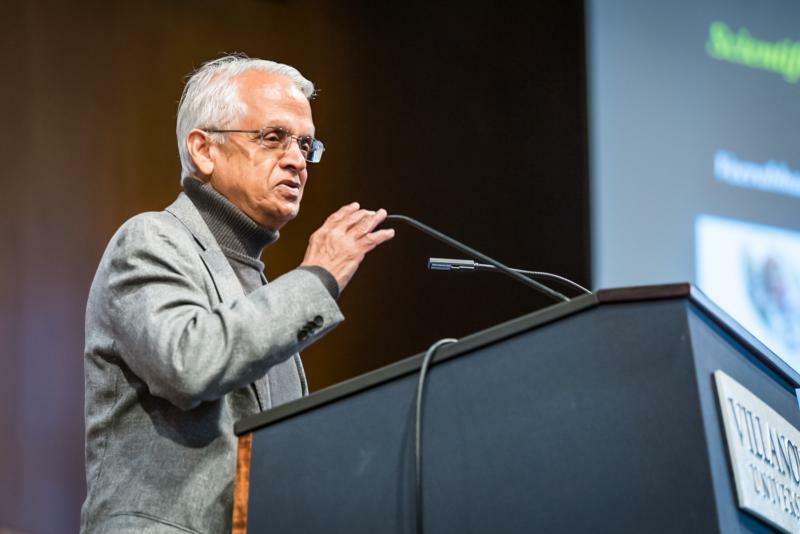 If not addressed, global warming will lead to stronger and larger storms and wildfires, said Veerabhadran “Ram” Ramanathan. The recipient of Villanova University’s 2018 Mendel Medal, he recently addressed an audience of more than 600 people at the university about the dangers of climate change and its impacts for the future. — How much time do we have before climate change becomes unmanageable? — How much time do we have to bend the curve and steer climate away from unmanageable levels? — What are the solution sets still available to us? — What can people do to contribute to the solution? First awarded in 1929, Villanova’s Mendel Medal honors 19th-century Augustinian friar and scientist Gregor Johann Mendel, best known as “the father of modern genetics” for his discovery of the laws of heredity that bear his name. In awarding him the Mendel Medal, Villanova recognized Ramanathan’s research accomplishments: his discovery of the greenhouse effect of halocarbons, particularly chlorofluorocarbons (CFCs) previously used in aerosol products; his prediction in 1980 that global warming would be detected by the year 2000; his work with NASA’s climate satellite during the 1980s to identify and quantify how the radiation field interacts with water vapor and clouds to regulate climate change; and his ongoing scientific search for solutions to the growing consequences of global warming. Ramanathan’s recent finding — that mitigation of short-lived climate pollutants will slow down global warming during this century — resulted in a proposal adopted by the United Nations and 30 countries, including the United States, to form the Climate and Clean Air Coalition. Speaking about global warming and the impacts of drought, storms and flooding, Ramanathan said that in the 1970s, ice in the Arctic reflected 38 percent of the sun’s light. By the turn of the century, it had decreased to 32 percent. The earth, he continued, is absorbing more light and heat at an unprecedented rate. Concluding his speech, Ramanathan urged the audience to take steps to slow down the warming process which, if not addressed, will ultimately lead to stronger and larger hurricanes and wildfires. “Action will make a huge, huge impact,” he said. Chizar writes for CatholicPhilly.com, the news outlet of the Archdiocese of Philadelphia.